Painting with Light - Amanda Sage workshop from George Prentoski on Vimeo. Through my unique painting education in Vienna through my mentor Michael Fuchs 1997-1999 & then as an assistant & student to Ernst Fuchs for 10 yrs. I am now compelled to continue the tradition of sharing technique & opening portals to those seeking tools to better express their own personal vision. My first art teacher was Dawn Diehl, my grade school teacher at the Shining Mnt. Waldorf School in Boulder, Colorado. She introduced my to the art of the Renaissance when I was 12 yrs. old & has been a great influence in her enthusiasm for teaching. My second great influence in my art education was Hikaru Hirata, a japanese-american fantastic realist, who was synchronistically my high school art teacher from the ages of 16-18. During high school I also studied portraiture independently with Laura Marshall in Boulder, Colorado. The day after graduating from the Waldorf School in Boulder I enrolled in a 3 week painting intensive with Philip Rubinov-Jacobson & Michael Fuchs in Boulder. This then led to an invitation by Michael to do an apprenticeship like the old masters for 2 yrs. in Vienna, Austria. My first teaching experience was to lead the first week of underpainting instruction at the ‘Old Masters, New Visions’ summer workshop as an assistant to Michael Fuchs & Philip Rubinov-Jacobson in Payerbach, Austria in 1999. There I met Andrew Gonzalez for the first time. I also continued assisting in the 2000 summer workshop where I then met Laurence Caruana. In 2004 I took on my first apprentice, Suzi Vrbka in the same manner that I apprenticed under Michael Fuchs. This lasted for over a year, where then a couple private students followed. It wasn’t until 2010 where I began to focus again on translating what I had learned & discovered through living & working as an artist around the world, into a program that could be passed on. Laurence Caruana had been developing a 3 week painting seminar in Italy titled ‘Visions in the MischTechnik’ since 2008 & invited me to co-teach in the summer of 2010. This fully initiated me into my mentoring role, & catapulted me into articulation & refinement of my own approach in painting, as well as jolting my memory of all the great wisdoms & keys that had been passed down to me. I have since created a 5 day Painting Intensive program titled ‘Painting with Light’. It is based on a revised version of the old masters technique of underpainting & glazing in oil, also known as the Mischtechnik (mixed technique). The first one was in Boulder, Colorado at the Shining Mnt. Waldorf School Arts Dept. in April 2011, following immediately another 5 day intensive in Chicago. Since then I have continued to develop my program, ranging from 1 day workshops to 5 weeks. Many students return to digest more of the concepts and the friendships that are formed are inspiring! 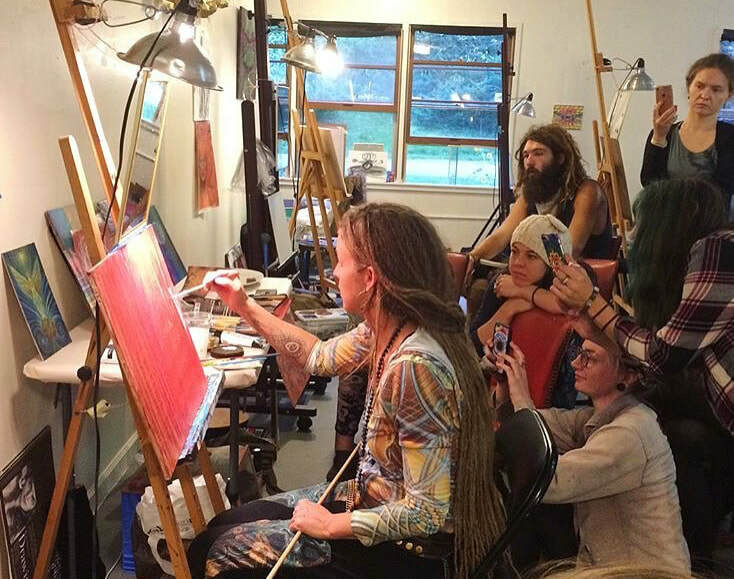 I teach fully booked workshops annually at the Chapel of Sacred Mirrors (CoSM), Alex and Allyson Grey's Art Sanctuary in New York. And have done multiple workshops in Australia, Costa Rica, Italy, Vienna, Colorado and Los Angeles.